How Can I Tell if My Baby Is Allergic to What I'm Eating? According to the U.S. Food and Drug Administration, nearly 6 percent of U.S. children under three years old have food allergies. The foods that you eat, including common allergens, will pass through your system and along to your baby through your breast milk. As a nursing mother, it is important to understand the signs of an allergic reaction so that you can easily identify if your baby is allergic to something you eat. Quick identification and reaction is key to protecting your baby. Food allergies exhibit in a variety of ways, depending on the severity of the allergy and the individual response. Infants who have an allergy can show any one or more of many symptoms. Itchy, red and bumpy skin rashes and eczema are common indicators of food allergies. Gas, stomach discomfort and diarrhea are also signs that your baby may be having an allergic reaction. Severe allergic reactions may cause respiratory distress, wheezing and itchy feelings in the throat or mouth. An infant with gas or stomach cramping from allergies may be fussy, have difficulty sleeping or may keep pulling his knees up, curling his tummy around his knees. When your diet includes common allergy-inducing foods, your baby may have a reaction as that food is passed through your breast milk. Eggs, cow's milk, fish and shellfish, wheat, peanuts, soy and tree nuts are the most common dietary allergens. Nuts, fish and shellfish typically cause more severe allergies that children do not outgrow -- while they may outgrow allergies to foods such as wheat, milk and eggs. Be aware that some foods may cause discomfort -- not necessarily allergic reactions. Spicy foods, cabbage and broccoli, for instance, may cause some gas and digestive discomfort for your baby, but not an allergic reaction. The easiest method of identifying a food allergen when you are breastfeeding is to keep a food diary. Make a note of everything that you eat and what time you eat it. Record your baby's feedings, noting what time and how long your baby eats. 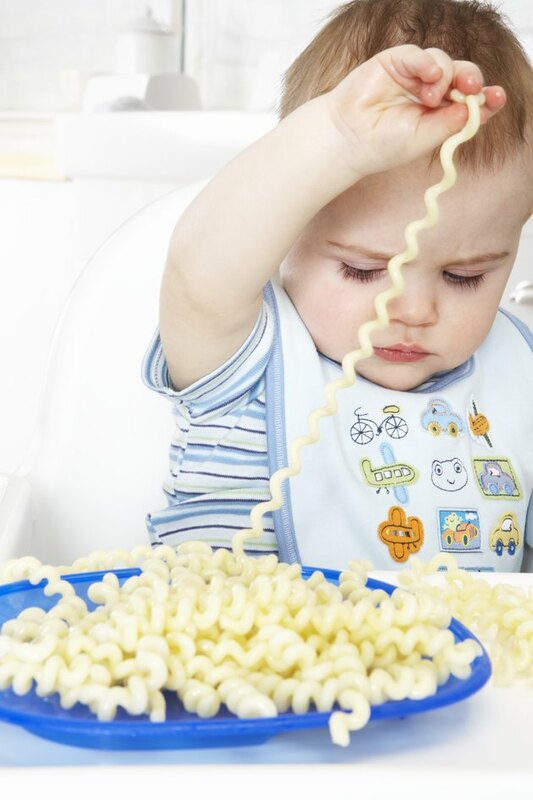 After each feeding, make a note of any odd behaviors you see or any signs of allergies in your little one. As you start to notice problems, refer back to what you ate last before the feeding. Over time, trends should develop and help you see what the common factor is. More commonly used when a baby is starting solid foods, the elimination diet is another method for breastfeeding mothers to identify the cause of an allergic reaction. Eliminate all of the common allergy-inducing foods from your diet. Introduce one at a time, several times over the course of a week. Watch your baby for any reactions after breastfeeding on the days when you eat a known allergen. Can I Eat Goat Cheese if My Baby Is Allergic to Milk? Does a Milk Allergy Rash in Infants Look Different Than Other Rashes?